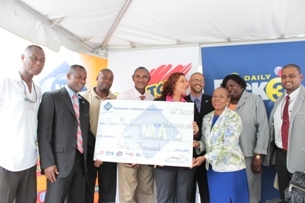 Its mandate includes supporting culture, and on Wednesday 24 July, the National Lotteries Authority announced that it will be sponsoring Panorama and other pan related events for the 2013 carnival celebrations to the tune of EC$340,000. “We pledge our increased support for the coming years, with the hope that the management of SpiceMas will be handled properly to allow for minimum cash injection by the NLA. We are interested in assisting with the whole management of the Carnival in terms of the finances,” said Mr. Hayden Redhead, Chairman of the Authority’s Board of Directors. Mr. Geoffrey Gilbert, General Manager of NLA, said that the Authority is extremely proud to be supporting the carnival celebrations. “$340,000.00 sounds like a lot, but we are actually giving much more by way of logistical and technical support. Already, our two outlets are involved in the ticket sales. We are very serious about the overall management of SpiceMas and have already drafted a proposal for presentation to SMC after Carnival, regarding the 2014 SpiceMas,” he informed the media. Specific to the playing of the games of the NLA, the company has recently launched its 4th edition of the Access Granted promotion. 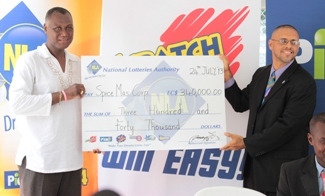 A total of 204 SpiceMas tickets for major Carnival shows can be won by players who spend $6.00 or more in Lotto and Daily Pick 3 from 22 July through 10 August 2013. Over 36 persons have won thus far. Finance Manager of the NLA, Mr. Richard DeAllie, who performed the role of Master of Ceremony of the press conference, added that very recently, on 17 July 2013, the NLA marked 20 years of selling lottery games via terminals and Lotto. “Lotto,” he said, “was the first game introduced with the terminals back in 1993.” Quite a number of activities have been planned for the rest of the year to commemorate the milestone. Already a breakfast was held for employees and sensitization on the milestone has been ongoing.